The HPE™ BlueHorizon™ is a flatbed system for horizontal electrophoresis using precast gels, self-cast gels and gel strips. 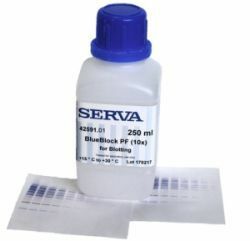 Main applications are isoelectric focusing (IEF) including the run of IPG strips (like SERVA IPG BlueStrips), 2D PAGE and SDS PAGE, HCP analysis and separation of recombinant proteins/antibodies, but also the separation of nucleic acids in polyacrylamide gels. The unit consists of a stable metal housing and an integrated drawer. The drawer holds the cooling plate with connectors for the external refrigeration system (e.g. the circulatory refrigerator bath HPE™ Cooling Unit, cat. no. HPE-CU1). The cooling plate is made from special ceramic material (maximum gel size 260 x 205 mm) for efficient cooling. It provides even heat dissipation, allowing to run gels at a temperature as low as 4 °C. This is particularly important when applying high voltage to thin isoelectric focusing (IEF) gels. The electrode lid comes with one pair of platinum electrodes. Three fixed electrode positions allow the usage of a wide range of different sized gels. Optional, an electrode lid with a triple electrode arrangement for bi-directional gel run is available. 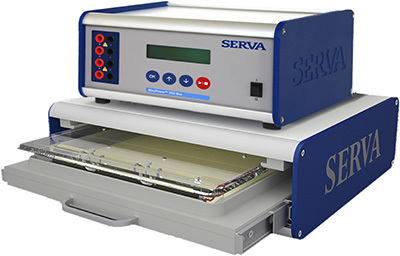 The easy-to-clean housing allows placing the power supply on top of the unit saving valuable space on your bench. High capacity cooling plate suitable for high voltage applications like IEF etc.